When I connect to my mac mini (from my Mac Book Air) what happens is that the connection is made as a regular screen sharing. So if someone connects a screen to the mac mini then all the activity is seen. But if there's already another user connected then I get a message saying that another user is already using the display, and then I can choose to share the screen or to "login as yourself", and that's great! How can I always connect as login so each user get his privacy? Using other software, RealVNC, should fix your problem. Download RealVNC. You only need a personal license, which is free. Enable Remote Management. 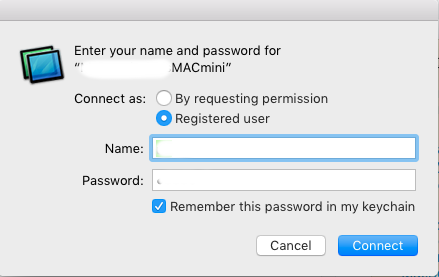 Go into System Preferences > Sharing > Remote Management. Configure RealVNC. It can be set up pretty much however you'd like. Connect to your computer. This will land you on the login page for your mac, and will only share a screen with it if logged in as the current user. Not the answer you're looking for? Browse other questions tagged mac-mini screen-sharing .